Automatically reads mixed stack of bills as it passes to count and sort based on denomination – unlike simple bill counters which cannot determine denomination and value. Never stop counting or sorting for a suspect bill, incorrect denomination or face. Those bills are sorted out into the reject pocket. Multiple modes and features for all your business’ money counting needs: Mixed Denomination, Sort, Face, Orientation, Count, Auto/Manual, Add, Batch, Add and Batch. Protects your business from counterfeits. Signature™ includes 2 CIS, ultraviolet and magnetic to ensure all collected cash is authentic. 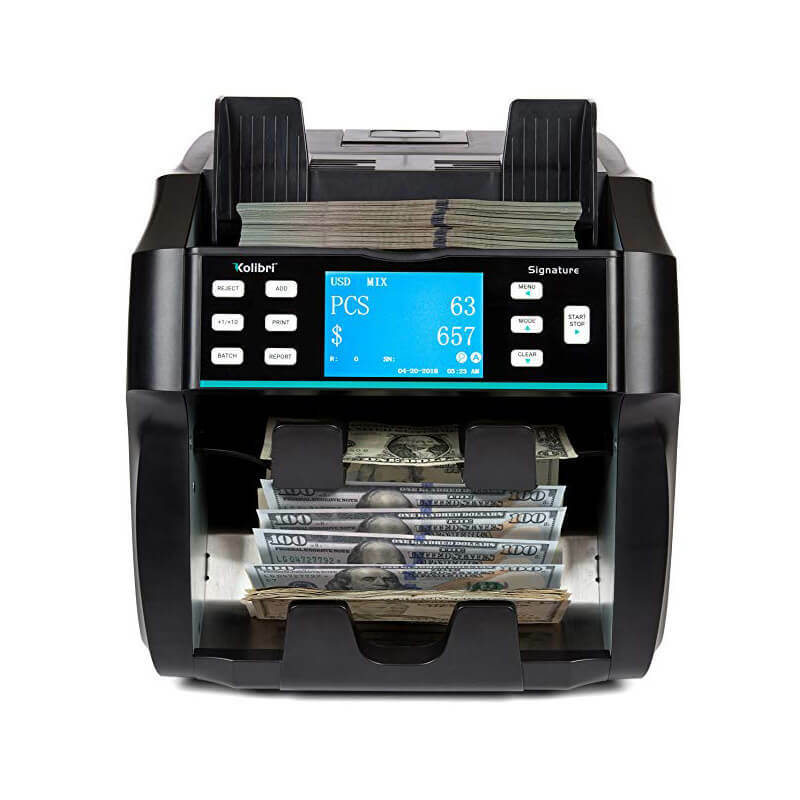 Easy-to-use interface, large LCD display, on-screen report and built-in printer to simplify this advanced cash counting system and save time. For high-performance currency counting and sorting, make Signature™ the one choice for your business. 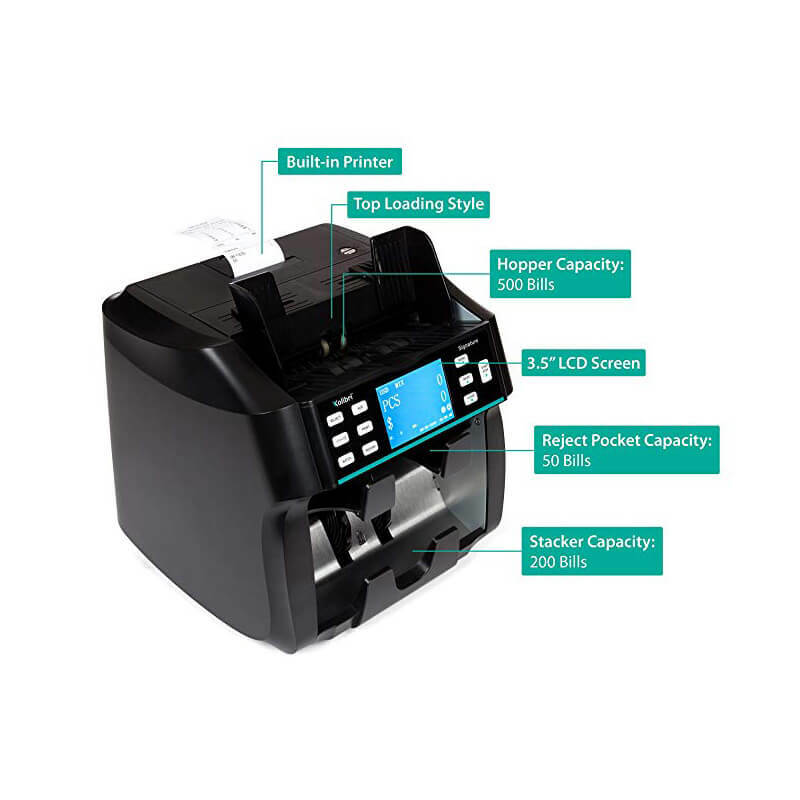 The popularity of various modern bill counter and sorter solutions remains steady. However, there is now a growing demand for currency discriminators, such as the Kolibri Signature. 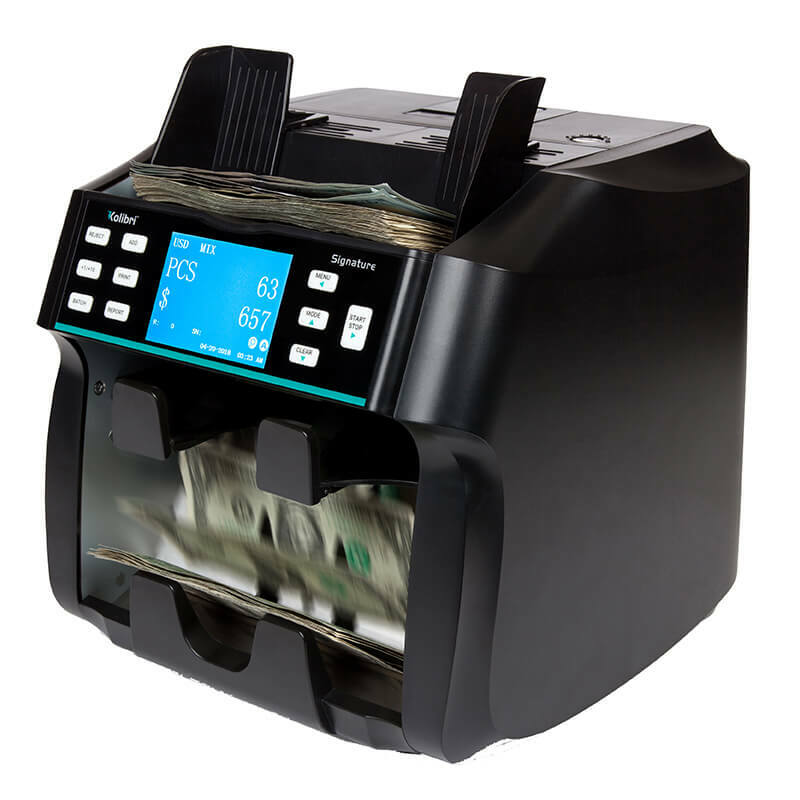 Discriminators are primarily used to read denomination, making them a sophisticated, technologically advanced and reliable 3-in-1 choice: in addition to counting and sorting banknotes, they also recognize their denomination. What’s more, among their many modes and options, it has a counterfeit detection feature for additional protection. In order to identify the denomination of the bill, discriminators use infrared light. How is a discriminator different from counterfeit detector machines? Counterfeit detectors, such as the KCD-2000 or the Bishop, come equipped with first-rate automatic counterfeit detection systems that instantly spot suspicious bills during counting. Namely, these devices employ UV detection to verify if the banknotes are authentic. Their ultraviolet scanners shine UV light on the banknotes and reveal characters or symbols printed in security ink. This is a special type of ink that remains invisible until it is illuminated with a UV lamp. 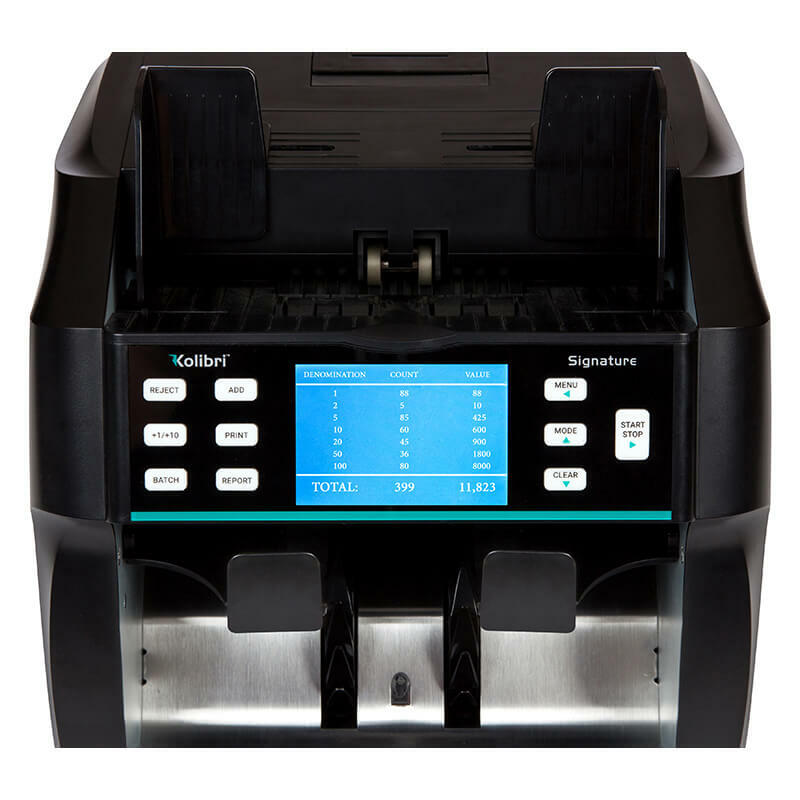 Kolibri mixed currency counter machines also use the magnetic ink recognition scanner. It checks the bill for text printed in magnetic ink or fine metal threads inserted in strategic places on the banknote. If a money counting machine with fake currency detector discovers either of these security features to be missing, it immediately halts the count and alerts the user. The Signature, which is a discriminator designed to perform multiple functions at once, does not halt the count on fake detection. Instead, the device has a special reject pocket used for these purposes. It also issues a report to the user once it encounters an inauthentic banknote. In addition to its UV light and magnetic ink recognition features, the Signature uses IR light to detect the denomination of the banknote. How many bills can the bill counter hold at a time? 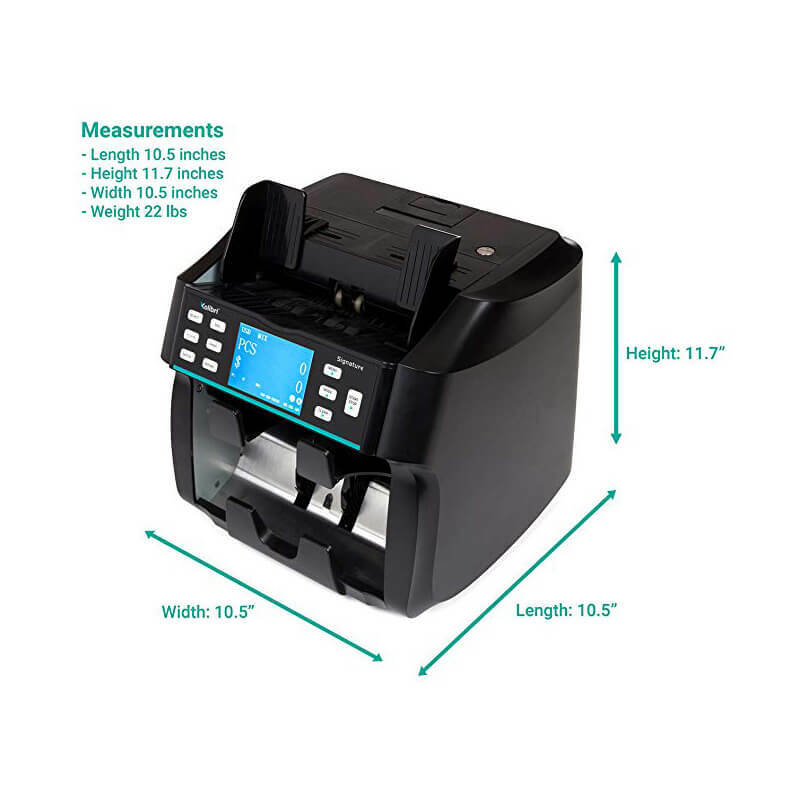 The number of banknotes that can be placed into a mixed bill money counter machine depend mostly on its physical size. The dimensions of the Kolibri Signature are 10.5″ x 10.5″ x 11.7″ (267 x 267 x 298 mm). 500 uncirculated bills can fit in its hopper, while its stacker can hold up to 200 uncirculated bills. The Signature’s volume is ideal for businesses such as dispensaries, restaurants, salons, and stores that process regular cash transactions. Combined with a Kolibri drop safe, it provides the full suite you need to successfully run an enterprise of that type. How fast can the machine count the bills? Although Kolibri Rook bill counters can count up to 1400, they lack the advanced features that discriminators such as the Kolibri Signature have. In general, the speed at which a mixed denomination currency counter can count cash money depends on its build quality and the technologies used. The Kolibri Signature can count 800, 1000, or 1200 notes per minute. The slower speed settings are designed for stacks of old, worn bills, whereas the higher speeds take full advantage of newer banknotes. Does the Signature mixed bill currency counter come with a warranty? Like other Kolibri products, the Signature arrives with a 1-year warranty from the day you bought it. This warranty shields the owner against manufacturing defects and any device-related problems that may occur during regular function as outlined in the user manual of the Kolibri bill counter. The warranty does not cover malfunctions caused by tampering, improper use, mishaps, and unauthorized opening or maintenance. It also does not protect against failures related to spilled drinks, foreign object damage, or improper transporting and storing practices. It doesn’t cover the shipping expenses of sending the Signature mixed denomination currency value counter to our technical service center. What is a feed gap on my mixed denomination bill counter? The feed gap is the physical height of the banknote feed path, and should be tuned approximately to the thickness of a single note. If this gap is too tight, some older generation money counters with counterfeit bill detection may be unable to move the cash into the scanning path. If it’s too wide, more than one note may enter the scanning path simultaneously, causing an error. The feed gap adjustment procedure for Kolibri products is designed to be simple, easy to learn, and to not require any previous experience in order to execute correctly. The Signature, in particular, guarantees versatility, efficiency and accuracy. For full instructions (with pictures), visit the Kolibri Signature FAQ section. What is the best mixed currency counter and counterfeit detector? Kolibri Signature is a top-of-the-line 2-pocket solution that not only caters to your cash-counting and sorting needs, but also reads denomination on the bills. It is a cutting-edge, must-have product for a forward-thinking business. This modern discriminator is also a dependable way to protect yourself and your business from counterfeit-incurred losses. You can easily order it online, and feel free to contact us if you have any additional questions about its features or our other products, such as the Domino. We’re eager to help you find the ultimate money counting machine that perfectly suits the needs of your business as it grows and expands.